Andhra Pradesh Chief Minister N. Chandrababu Naidu on Saturday termed Prime Minister Narendra Modi as the "publicity Prime Minister" and said the nation needs a new Prime Minister who can perform. "This Prime Minister is a publicity Prime Minister, not a performing Prime Minister. He and his government have betrayed the nation. "The country wants a performing Prime Minister, someone who would work for the betterment of the poor," Naidu said here at Mamata Banerjee's united opposition rally. 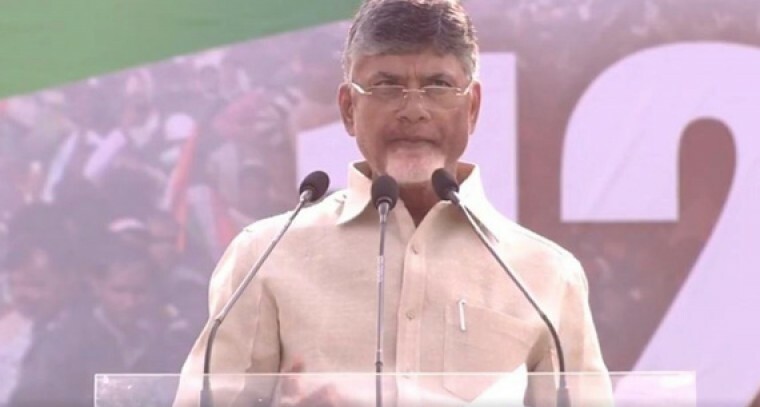 Accusing the BJP-led NDA government at the Centre of trying to divide the nation, the Telugu Desam Party (TDP) chief said the opposition forces were getting united to save the democracy and urged people to carefully choose who they like to go with in the upcoming Lok Sabha elections. "Today is a historic day. The BJP and NDA want to divide India and we want to unite India. That is the purpose all the leaders have come here with one voice -- Save India, save democracy and also unite India -- that is the campaign we are going ahead with," Naidu said. "Do you want Modi and Shah to come back in power (after 2019)? Do you want change or not?" he asked the massive crowd at the rally. Hailing West Bengal Chief Minister Banerjee's efforts to bring senior opposition leaders from across the country on one stage, Naidu said he would like to hold a similar opposition rally in Andhra Pradesh's Amaravati and invited all the leaders present on the stage at the Brigade Parade Ground. "We want to organise another rally like this in Amaravati. I invite all the leaders there," he said. He criticised a number of central government policies, including the demonitisation move, GST, agricultural policies and fuel price hike, claiming current regime has only given a "high performance in corruption". "Modi betrayed farmers in a big way. A big fraud is going on in the name of agricultural policies. A number of states, including Andhra Pradesh and Bengal are doing far better than the Centre in terms of farmer welfare," he said. He further accused the Centre of interfering with the federal set-up and harassing the states run by opposition parties' governments. "The government is also interfering in the federal set up. They are harassing the states. They are creating problems in Kashmir and Karnataka. We want to warn the Centre from here today that if it misbehaves with Karnataka in any way, it will have to pay a big price," Naidu said referring to the claims of horse trading allegedly underway to destabilise the JD-S-Congress government. Echoing former Jammu and Kashmir Chief Minister Farooq Abdullah, Naidu also termed the use of electronic voting machines (EVM) as a big fraud and said the country should go back to paper ballots in the next elections. He said the entire country's mood is to have a new Prime Minister in 2019. "In 2019 India is going to see a new Prime Minister. That is the mood of the nation. We are considering the nation first. To protect the nation and save democracy everyone in this country must be united," he added.